BingTracker is yet another Crossrider application that our malware researchers have observed and analyzed. It was discovered that just like other Crossrider apps that we have reported in the past, including FBTune Color, Hdview, and Medpvid, BingTracker is an advertisement-supported program, and you should delete it from your PC. If you have more questions than answers regarding the removal of BingTracker, you first need to read the report and learn how the threat works. According to the most recent discoveries made by our malware research team, BingTracker only affects Internet Explorer browsers. Of course, if you have found that you need to delete BingTracker from other browsers, you should post a comment below, and we will help you get rid of the suspicious application. 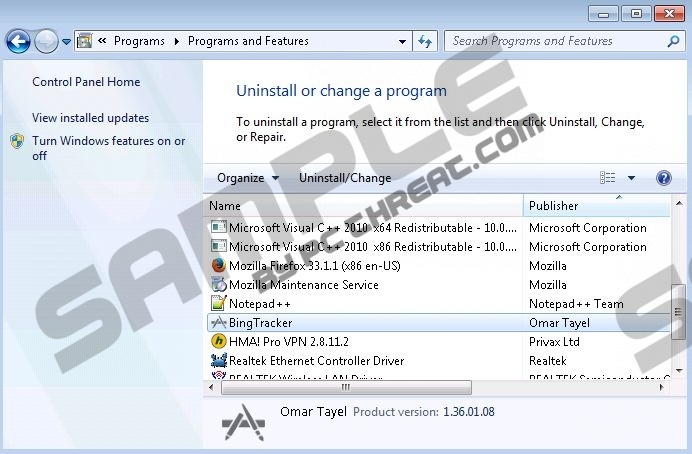 Luckily, it is likely that you will be able to remove the threat from any browser by uninstalling it from your PC. Unfortunately, no one is protected against the leftover files which could be used to deliver ads. The advertisements delivered by BingTracker are our main concern. These advertisements could easily redirect you to sites that you should stay away from. If you do not want to be exposed to unreliable sites and misleading content, you should remove BingTracker ads. Do you know how to do that? It is simple! All you have to do is delete the advertisement-supported program. It is very important to identify every single threat on your PC that requires removal. It is unlikely for BingTracker to travel on its own, and so we dare to state that it has entered your operating system bundled with malware. Do you know which apps were installed with adware? You can use a legit malware scanner to identify these threats. Note that you do not need to invest money in a good scanner. SpyHunter offers a free scanner which, in a matter of minutes, will examine your operating system and will let you know which programs associated with BingTracker you need to delete. The benefits of automatic malware removal software are undeniable, especially when there are several different programs that require removal. If you want to choose the hard way, you can try to delete BingTracker manually. Note that the instructions below only show how to remove BingTracker. The remaining threats might have to be approached differently. If you are not experienced, it is best you choose the automatic removal option instead of the manual removal. Navigate to the left corner of the Taskbar, click Start, and select Control Panel. Get rid of the undesirable application by clicking the Remove button. Navigate to the Taskbar and click the Windows button on the left to open a menu. Open Control Panel to find more options and click Uninstall a program. Enter Control Panel to access the menu and click Uninstall a program. Right-click and Uninstall the application you have chosen to delete from your PC. Quick & tested solution for BingTracker removal.